In this weighty, riveting analysis of the life of Dietrich Bonhoeffer, Metaxas (Amazing Grace) offers a comprehensive review of one of history&apos;s darkest eras, along with a fascinating exploration of the familial, cultural and religious influences that formed one of the world&apos;s greatest contemporary theologians. A passionate narrative voice combines with meticulous research to unpack the confluence of circumstances and personalities that led Germany from the defeat of WWI to the atrocities of WWII. Abundant source documentation (sermons, letters, journal entries, lectures, the Barman Declaration) brings to life the personalities and experiences that shaped Bonhoeffer: his highly intellectual, musical family; theologically liberal professors, pastoral colleagues and students; his extensive study, work, and travel abroad. 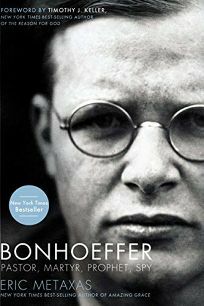 Tracing Bonhoeffer&apos;s developing call to be a Jeremiah-like prophet in his own time and a growing understanding that the church was called ""to speak for those who could not speak,"" Metaxas details Bonhoeffer&apos;s role in religious resistance to Nazism, and provides a compelling account of the faith journey that eventually involved the Lutheran pastor in unsuccessful attempts to assassinate Hitler. Insightful and illuminating, this tome makes a powerful contribution to biography, history and theology.